Alexis Strum is an actor, director, musician and songwriter. She has written songs for Kylie Minogue and the hugely successful male-centric teen-angst series, The Inbetweeners. Always the Bride, Strum’s debut one-act play, is an excellent oddball comedy about a group of women, lead by control-freak Shauna, who come together once a month to attempt to allay the symptoms of Post Wedding Day Comedown syndrome, by meeting in secret to wear their wedding dresses and to attempt to regain something of the glory of their Fairytale Day (if glorious it was, of course), while sharing the various experiences of their married lives. Strum’s play is a wry look at the stories women tell themselves and each other, unpicking the realities of many suburban marriages from the abundant shared fantasies that help keep marriage going as a social institution. As a performer, under the guise of her comedy alter-ego ‘Denise’, Alexis creates sketches for her own YouTube Channel, www.youtube.com/thedenisechannel, one of which was featured on The British Comedy Guide (featuring Sue Holderness from ‘Only Fools And Horses’) and The Huffington Post, and was nominated for a British Comedy Award (Best Internet Comedy Programme). As Denise, Alexis has gigged with the likes of Jarred Christmas, Joe Lycett, James Acaster, Daniel Simonsen and Tony Law and runs and MC’s the Big Belly Laugh comedy night (Hackney Attic, etc). ’Always The Bride’ ran for four days at the New Wimbledon Studio Theatre as part of their ‘Fresh Ideas’ Season for emerging playwrights, with all profits from these performances going, significantly perhaps, to the Samaritans Waltham Forest. Densely packed with hilarious one-liners, consistently well acted and directed, and showing a sure touch and ebullient confidence unusual in a debut, Always the Bride announces Alexis Strum as one to watch in an already crowded and highly competitive marketplace. 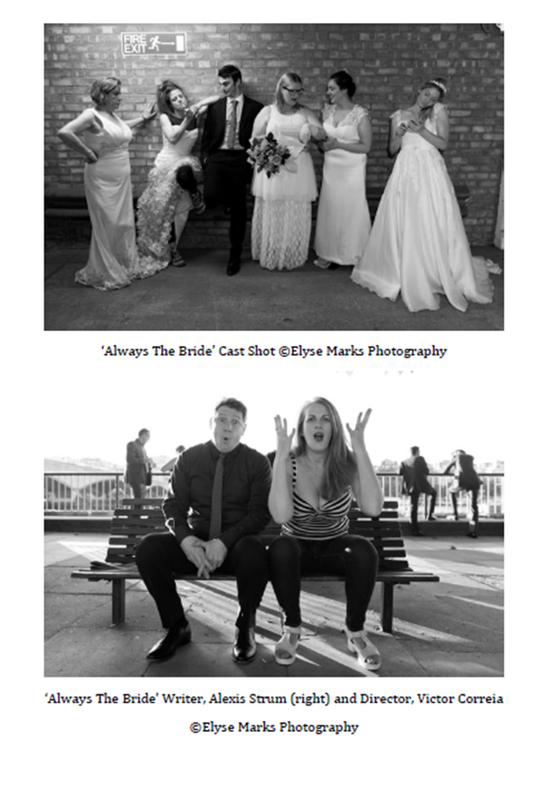 This entry was posted on 30 July, 2015 in homepage and tagged Alexis Strum, Always the Bride, Keith Rodway, Victor Correia, Wimbledon Studio Theatre. Bookmark the permalink.